and the prevailing power of good people in a big, bad world. 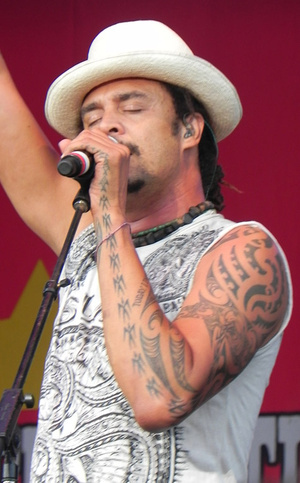 PORTLAND — Michael Franti might be the most pleasant drill sergeant ever. His words were not a request, but an order obeyed by the throngs of sun seekers who packed a parking lot on the waterfront for Sunday’s inaugural entree in the Concerts on the Waterfront at Ocean Gateway series, presented by the State Theatre. By appearances, almost everyone obliged – hands and fists pumped high over heads, pulsating to the infectious rhythms and beats of Franti and his band Spearhead. They layered hip-hop on top of reggae, funk and rock, and presented a powerful concoction of feel-good, groove-filled music. The Ocean Gateway series could not have gotten off to a better start. Franti and Spearhead were a perfect choice because of their socially aware message, which brings people together as one. The weather was ideal – warm and sunny with just a hint of cool as the sun faded – and the setting felt spectacular. Granted, a grass field holds more appeal than a parking lot, but it’s hard to beat the large, open space offered by the Ocean Gateway parking area. The concert site never felt cramped, except maybe up front. A handful of boats bobbed at anchor in the water by the concert site, and passers-by on the bike path and on the upper reaches of a nearby parking ramp were able to enjoy the sounds of the show from the periphery. As for the sound, kudos to the folks in charge of the production. Franti’s vocals were crisp and clear, and from the vantage point about halfway between the stage and the sound board, it was easy to distinguish among the instruments and enjoy the concert for its musical qualities. Moving back and forth from a headset mike and a microphone on a stand, never once were Franti’s vocals lost to the elements. And to be sure, the enjoyment of this show landed squarely on the shoulders of Franti and his music. Franti filled his 90-minute-plus set with songs about human perseverance (“Hey World”), unconditional devotion (“Anytime You Need Me”) and the prevailing power of good people in a big, bad world (“Hey, Hey, Hey”). Franti towers above the masses at 6 feet 6 inches, but projects a massive calm. His smile is infectious, and his demeanor soft and welcoming. He exudes peace. Toward the end of the show, he filled his stage with dozens of small children from the audience, pulling them up and helping them dance the night away. Hyperbole? Yes, no doubt. But it’s hard to argue with the sentiment.